Lt. Gov. 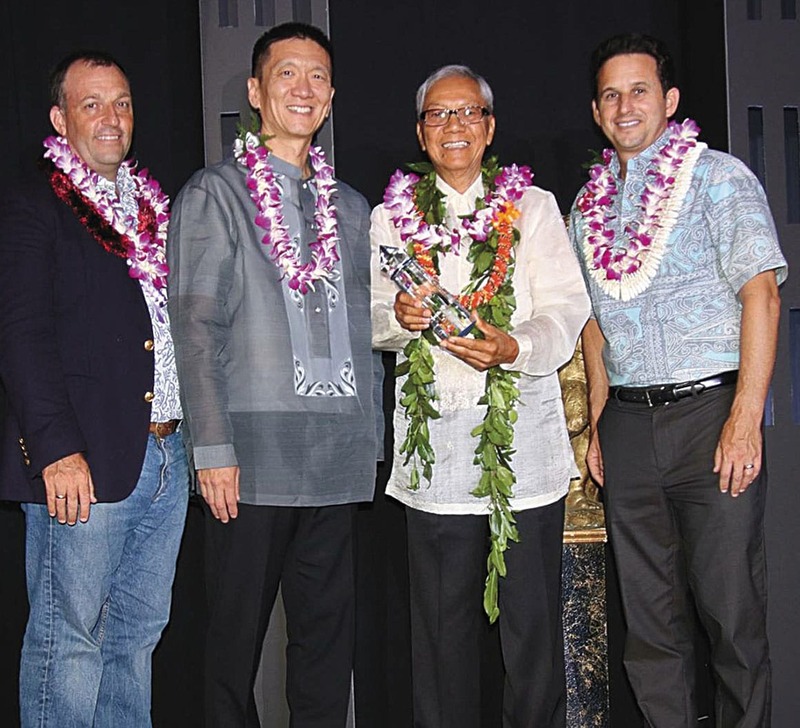 Josh Green, Former Lieutenant Governor/Attorney General Doug Chin and Sen. Brian Schatz shown with Leo Agcolicol who recently won the Lifetime Achievement Award from the United Filipino Council of Hawai‘i on Nov. 2, 2018. Our featured Sakada Offspring is the epitome of a “man of service.” As a young man from the Philippines, as a working adult, and as a fellow retiree, he continues to be of service. He is none other than Virgilio “Leo” Agcolicol. Virgilio was born in Paoay, Ilocos Norte, Philippines on November 12, 1943. He lived with his parents, Jorge and Eulalia Rico Agcolicol (now deceased). He attended Paoay Elementary School, Paoay North Institute High School and graduated with a Bachelor of Science in Commerce degree (majoring in Banking in Finance) from Northwestern University in Laoag City, Province of Ilocos Norte. 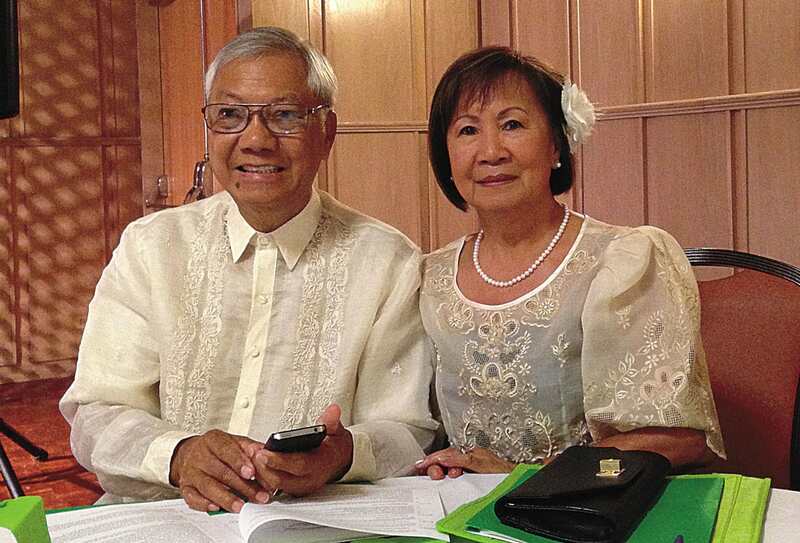 Leo is married to the former Virginia “Virgie” Bermudez Agustin. They have a daughter, Valerie Agcolicol Aguirre (husband: Malcolm Aguirre). 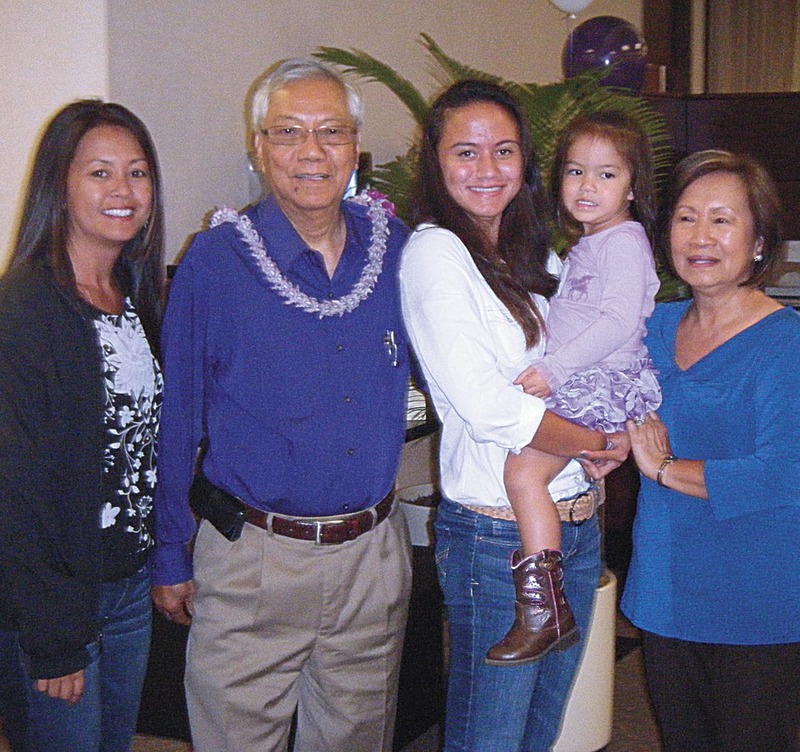 They have two grandchildren, Ka‘iulani, 19 years old, a sophomore attending Linfield College and Kalena, 8 years old, 2nd grade attending Pōmaika‘i School. 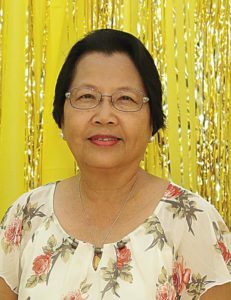 Leo’s in-laws are August Salvador Agustin (1946 Sakada, deceased) and Cecilia Bermudez Agustin, who are both from Camiling Tarlac, Philippines. Both in-laws worked at HC&S. Leo arrived in Hawai‘i on July 12, 1967 through the petition of his brother Conrad R. Agcolicol. 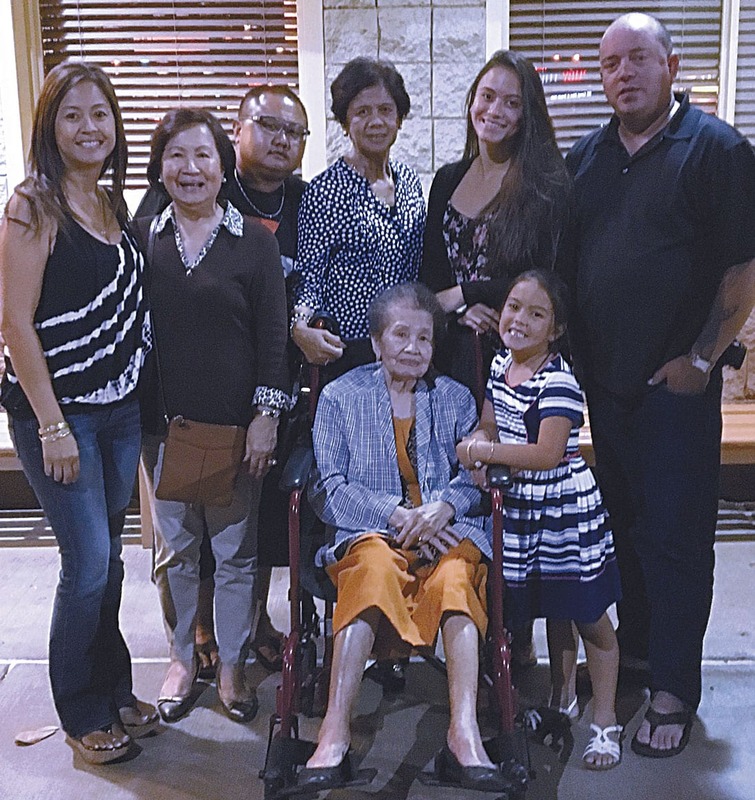 Conrad came to Hawai‘i on a student visa through their Uncle, Froilan Agcolicol. Conrad was only 15 years old when he arrived in Hawai‘i. He graduated from St. Anthony High School. Since Conrad was on a student visa, the immigration wanted him to go back to the Philippines. He did not want to go back home so instead, he went to Honolulu and continued his education. He attended Jackson College, enrolled in Business, and at the same time worked part time as a waiter and a time keeper for a construction company and other jobs that he was able to do in order to support himself. After finishing his business degree from Jackson College, the immigration was after him again. That same time, he met a Filipina girl from Maui by the name of Dolores Amano (a dental assistant), fell in love and they got married. They now reside in Arizona. Three years later, he gained his U.S. citizenship and Conrad was able to stay in the U.S. permanently. They are blessed with three children. Even though Conrad was already married at that time, he was still drafted to serve in the military. When Conrad was in the military, he wrote to Leo asking him if he was interested in coming to the United States/Hawai‘i. Leo expressed his interest in coming so Conrad filed a petition for him as a brother of an American citizen (5th preference). With the grace of God, not very long after his petition was filed after a year, his petition was approved and Leo was able to come to Hawai‘i, leaving the Philippines on June 28, 1967 and arriving in Honolulu on July 12, 1967 via S.S. President Wilson. Leo decided to settle down on Maui to keep his Uncle Froilan company and lived with him for two years because his brother Conrad was in Germany along with his family. Conrad was ordered to go to Vietnam, so he brought his family back to Maui to live with his in-laws in Lahaina. When he finished his Vietnam tour, he was assigned to Fort Ord, California. A few years later, he retired from the military as a Sergeant Major. Valerie Aguirre, Leo Agcolicol, Ka‘iulani and Kalena Aguirre, and wife Virgie. Leo has a very interesting Sakada Connection. First, his father, Jorge Agcolicol came to Hawai‘i in 1924. Many people call them, “old timers.” They paved the way for all of us who came later. He stayed on Maui for several months and worked for Kahului Railroad. He moved to California and worked there for almost three years. He came back to Maui in 1928 and worked for the sugar plantation for a few months then went back to the Philippines later that year. Upon arrival in the Philippines, he worked for different companies like Baccrach Motor Company as a cab driver and mechanic. When World War II broke out, the Japanese occupied some parts of Manila and the company sent all of their employees to be with their families in the provinces. Jorge Agcolicol went back to Paoay, Ilocos Norte. The same year that Leo’s Dad went back to the Philippines in 1928, his Uncle Froilan desired to come to Hawai‘i. When he arrived in Hawai‘i, his first assignment was on Hawai‘i Island. But after a few months there, he moved to Maui to work for the Hawaiian Commercial and Sugar Company until he retired. Agcolicol is a Veteran of the Vietnam War. When Leo arrived on Maui, he was interested in working in one of Maui’s banks because of his expertise in finance/banking. He submitted his employment applications to most of the local banks here on Maui but he was told there were no jobs available at that moment. He was also told that his application was good for six months so when a job was available he would be called. From September 1967 to February 1968, Leo worked for Wailuku Sugar Company as a field worker. After he was laid off from Wailuku Sugar in 1968, he was looking through the newspaper for job openings one day when his telephone rang. It was a call from Central Pacific Bank asking him if he was still interested in a job. He was definitely interested. It was the job Leo held until his retirement on October 31, 2013. Leo received a call of duty. He was drafted in the United States Army from 1969–1971. He had his basic training in Fort Ord, California. He also had an overseas tour of the Republic of Vietnam. 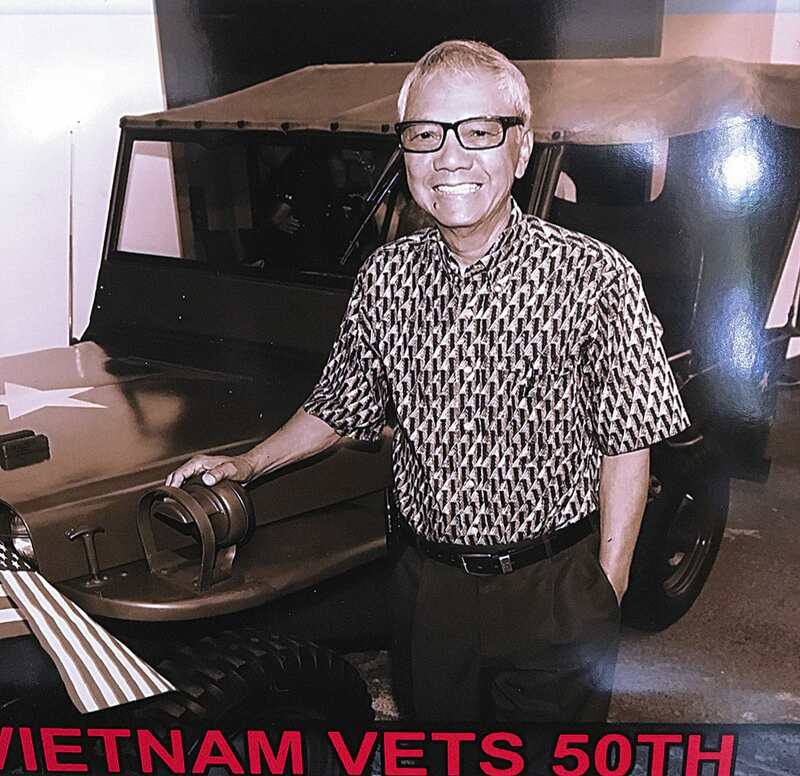 He was assigned to the 593rd Support Group in the Finance Division and attached to the NCO/Open Mess overseeing the operation of 36 NCO’s in Qui Nhon area. Leo continued working at Central Pacific when he came back from the Army. While working, he was selected by senior management to attend the following universities to expand his knowledge in banking: University of Central Florida, Orlando, Florida—Branch Management Institute; Oklahoma University, Norman, Oklahoma—Commercial Banking; and University of Wisconsin, Madison, Wisconsin—Graduate Schools of Banking. The positions he held at Central Pacific Bank are: Loan Officer, Assistant Vice President & Assistant Manager, Assistant Vice President and Branch Manager, Assistant Vice President and Corporate Banking Officer, and Business Banking Officer. Being a man of service, Leo has been active in many organizations and received many awards: Maui Filipino Community Council (Past President/Board member); Paoay Curimao Hawai‘i Organization (President); Maui Filipino Chamber of Commerce (Past President); United Filipino Council of Hawai‘i (Past President); Knights of Columbus, District 8 (District Deputy); and Maui Arts and Cultural Center (Director). He also served as a Director for J. Walter Cameron Center, Salvation Army, Maui Memorial Hospital Foundation, former Grand Knight, Knights of Columbus (Christ The King Church), Maui Beach Hotel Council 15594, Veterans of Foreign Wars (VFW) lifetime member, Disabled American Veterans, and Vietnam Veterans of Maui. Leo received the following awards: Golden Sakada Award for Lifetime Achievement on November 2, 2018, held at the FilCom center, on O‘ahu. It was sponsored by the United Filipino Council of Hawai‘i. In 1996, he received the Gintong Pamana Award given by the Maui Filipino Chamber of Commerce and in 2006, he received the Gintong Pamana Award at the Filipino Centennial Celebration. Besides these awards, he was awarded twice as Outstanding Member by the Maui Filipino Community Council. Leo is also a veteran radio announcer with Bloomberg Radio (KNUI AM 550) from 1974 until now, a community oriented program. 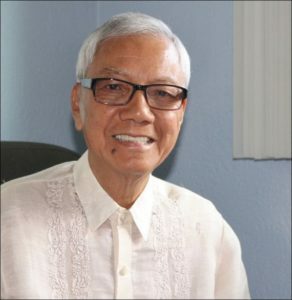 During his first term as president of the Maui Filipino Community Council (1979–1981), he was at the forefront when MFCC intervened and pushed for reform of the controversial treatment and conditions of farmer trainees from the Philippines. Conditions have improved but the program is already terminated. Some of the farmer trainees stayed and have their own businesses. A love between brothers is priceless. In 1975, Leo filed a petition for his oldest brother, Teodorico Agcolicol to come also to Hawai‘i. The petition was approved. Teodorico and his wife Isabel arrived in 1989 with their minor-age son, George. When Teodorico obtained his U.S. citizenship, he petitioned for their older and unmarried children, Juliana and Emmanuel. They arrived a few years later. Virgilio and Virgie’s marriage was tested with trials and tribulations but with great strong compassionate love blessed by God, it withstood for forty-nine years on January 17, 2019. They were married at Christ The King Church in Kahului on January 17, 1970. A week after their wedding, Leo was sent to Vietnam. He came back to Hawai‘i on October 1970 for R&R and obtained his U.S. citizenship at the same time. After a few days, he went back to Vietnam to finish his tour of duty. Finally, he came home for good in January 1971—two months early because troops were already being withdrawn from the combat area—the final withdrawal was April 1975. Their 49th anniversary was blessed at Christ The King Church at one of the masses. A year from now, they will celebrate their 50th wedding anniversary. This writer fondly calls their marriage as a “peanut butter and jelly sandwich kind of a marriage” because they go together well. Most of the time, Leo and Virgie are always together at parties and other functions. They are very supportive of each other’s undertakings. Virgie retired from H.A. Aquilizan M.D. Inc. She was Dr. Aquilizan’s receptionist/clerk for twenty years. Leo, you are one of those single drops. With your endless services, you help refresh the parched grounds of Maui, Hawai‘i, the United States of America and the world. Mahalo and best wishes to you and Virgie.